The history of Britain's occupation during antiquity by the Roman Empire is among the foundational narratives of British identity. Aside from its cultural implications, this saga in world history also left the island nation with a wealth of ancient Roman treasure beneath its soil. The most recent discovery of this kind dates back roughly 1,700 years. This particular ancient gold coin is an aureus, which served as the flagship gold coin of the Roman Empire for centuries before being replaced by the solidus. There have been a fairly staggering amount of Roman coins unearthed in Great Britain, especially over the past few decades with the help of modern metal-detecting technology. However, this latest discovery is part of an exceptionally exclusive group. 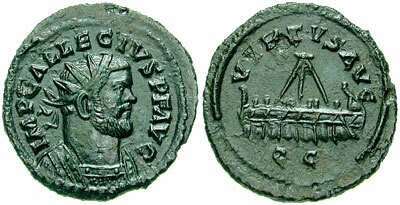 It shows the bust of Allectus, who briefly ruled as the Emperor of Britannia—the Latin name for the British Isles—at the end of the third century C.E. The coin was found in Kent, not far from the town of Dover. 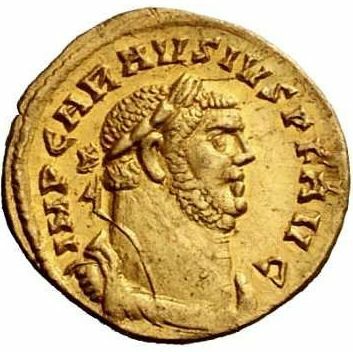 Only 24 examples of gold aureii bearing the face of Allectus are known to exist. Of the two dozen extant coins, two of them were discovered in Kent. Allectus is rather notorious for having usurped command of Britannia from his superior officer while serving as the province's treasurer. He then claimed the territory for himself, breaking ties with Rome and the broader empire. Given this backstory, the British press loudly characterizes these coins as depicting the "FIRST BREXITEER" since everything in British political life is related to Brexit these days. In any case, this rare Roman gold coin is expected to realized an impressive £100,000 ($131,000) at auction in June. Compared to most examples, its state of preservation after 17 centuries is difficult to believe: its details are remarkably sharp and complete in images provided by the auctioneers Dix Noonan Webb.